There can be many hidden hazards At the Coast. If you are heading out, stick to coastal paths, avoid mud and wear appropriate footwear and clothing. Let someone know where you are heading and when you expect to return, and carry a mobile phone. 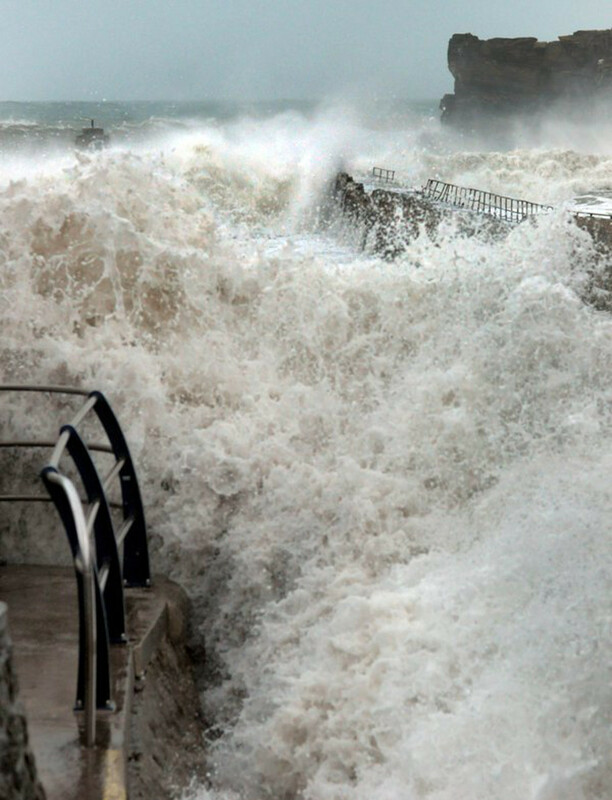 Piers, rocks, harbours and the water’s edge are not safe places to be when the weather is bad. Wave dodging is extremely dangerous. Even a small wave can quickly wash you into the sea. No photograph or selfie is worth risking your life for. If you see anyone in trouble call 999 and ask for the Coastguard. It’s great to spend a day out at the coast or seaside. 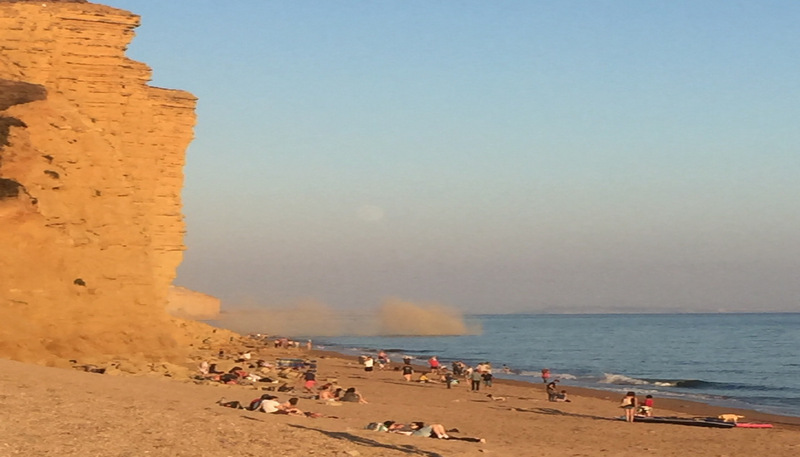 Whether you like cliff walks, boating or just soaking up the sunshine on a beach, there’s something for everyone. But sea and coastal conditions can change fast and you can get into trouble before you know it. To help you enjoy the coast safely, make sure you check weather and tides before you set out, wear appropriate clothing and footwear and be aware of the risks. For further information on coastal safety, please visit the Maritime and Coastguard Agency GOV.UK pages. If you get into trouble or you see someone else in trouble, call 999 and ask for the Coastguard or, if you are deaf or have a speech impairment, send an emergency SMS. 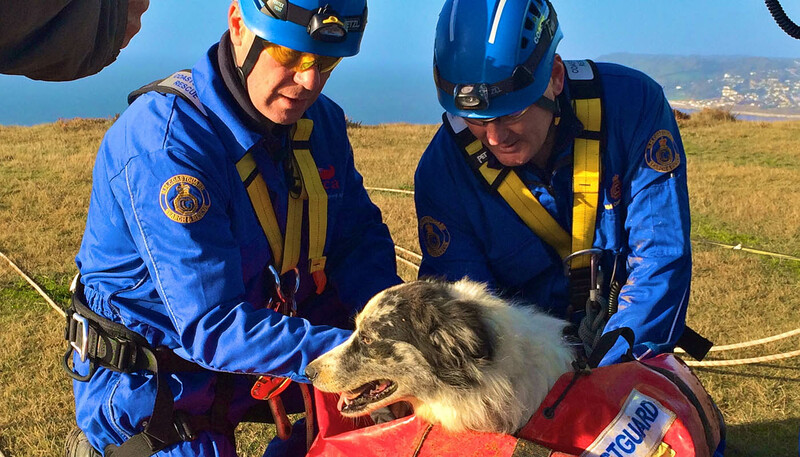 HM Coastguard is the emergency service which provides search and rescue at the coast and at sea. 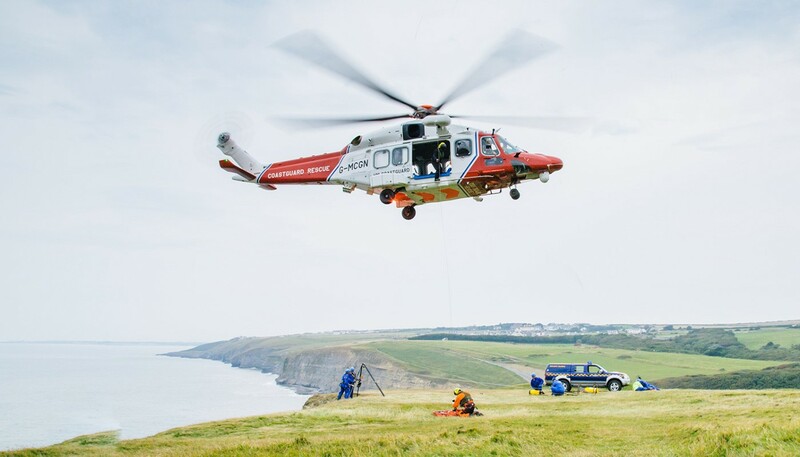 When someone’s in trouble, we send out helicopters, lifeboats and coastguard rescue teams. We coordinate this from our 12 control rooms around the UK coast. So if you spot someone in danger call 999 and ask for the coastguard. We’re part of the Maritime & Coastguard Agency, which regulates maritime and safety standards as well as saving lives at sea. For further information and guidance please visit our GOV.UK pages or contact the Coastguard. 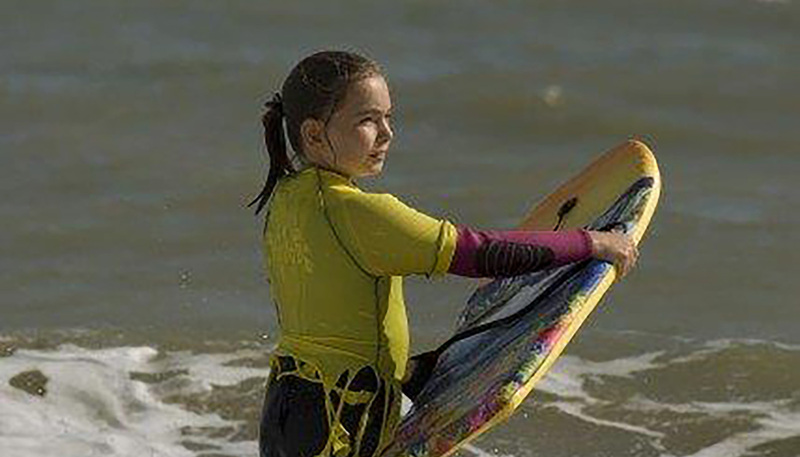 For schools and educational groups we also have activity booklets containing important safety information available at GOV.UK Seaside Safety. The seaside is a great destination for a day out. But don’t forget that conditions can change quickly and there can be unexpected hazards. Where possible, always swim or paddle on a lifeguarded beach. Make sure you know what safety flags mean. You can find more information at the Good Beach Guide. 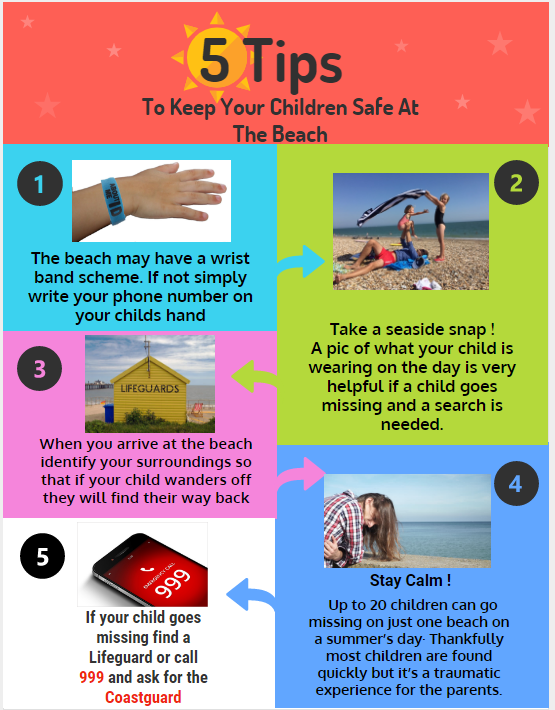 Keep an eye on children – take advantage of any local wristband scheme which can help identify your child if they wander off. 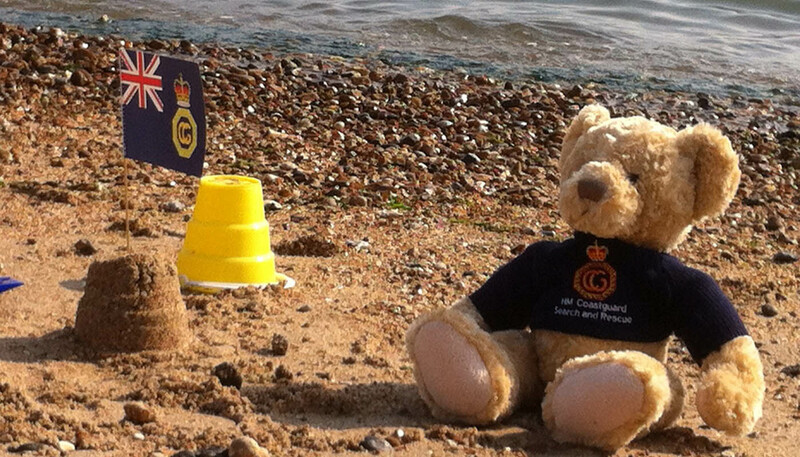 If you do lose sight of your child and you are worried, call 999 for the Coastguard. Don’t dig large holes or tunnels in the sand. Small sandcastles and holes are fine, but never dig anything deeper than waist height, as the sand can collapse and crush or suffocate you. Don’t wander too far along the shore, especially if beach exits are limited. You could become cut off by the tide, so remember to check what the tide is doing. If your stroll takes you around a headland or rocks, you can easily be cut off if the tide comes in when you aren’t expecting it. Sand hole collapses are rare but can be lethal if you become trapped in one. There’s nothing wrong with digging holes at the beach and filling them with water for your kids to play in. But if you dig a hole so deep that your head is barely poking out or burrow into a sand dune then you could be putting your life at risk. If it’s taken you three hours to dig your hole – that’s how long it might take someone to dig you out. These deeper types of holes are highly unstable. The wet harder sand that you dig out will dry out in the sun making it loose and the deeper you dig the more danger there is of the hole collapsing inwards and potentially trapping you inside. The best way to rescue someone is to create a circle of people digging with their hands, then another outer circle will do the same while also removing the sand from the first circle, more circles of people digging will be added as they become available.This will then create a wider shallow hole with no risk of any further collapse of sand. A perfect example of this was demonstrated at a sand hole training exercise with 30 people from Burnham Coastguard Rescue Team, BARB Search & Rescue – Burnham-on-Sea hovercraft, RNLIlifeguards, RNLI Lifeboats at Burnham-on-Sea, Beach Wardens and the Fire and Rescue Service using a constant digging action racing against time to rescue a pre-buried casualty. We want you to enjoy yourselves at the beach – that’s what it’s there for – just take extra care when digging large holes that could trap you if they collapse. Let’s share this and tell as many people as we can in time for the weekend. Stay safe folks and remember to call 999 and ask for the Coastguard if you see someone in difficulty. Grateful thanks to Burnham-On-Sea.com for letting us share this great footage! 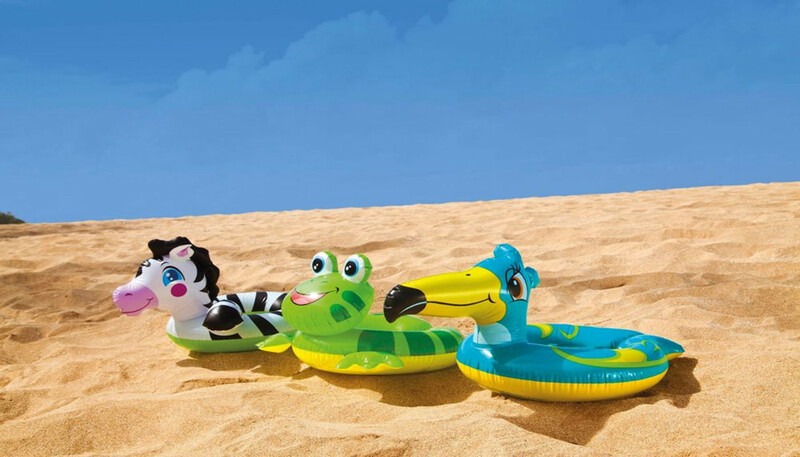 Blow-up lilos and toys are great fun in the swimming pool, but they’re best avoided at the seaside. They can easily drift out to sea and you may not notice until you’re a long way from shore and out of your depth. If you do find yourself being swept out to sea, stay with your inflatable and shout for help, waving your arms if possible. Don’t attempt to swim for shore if you are out of your depth. Rip currents are difficult to spot and even the most experienced swimmers can be caught out, so do ask lifeguards for advice. They will show you how you can identify and avoid rips. The best way to avoid rips is to choose a lifeguarded beach – you can find a list on The Good Beach Guide website – and always swim between the red and yellow flags, which show where is safer to swim. This also helps you to be spotted more easily, should something go wrong. You can find more information on rip currents on the RNLI website. Cliffs are often much more unstable than they look. When you walk, sunbathe or picnic beneath cliffs, loose shingle or large rocks can be dislodged and come crashing down. So stay away from them. A good rule of thumb is that you should keep at least the height of the cliff away, so that if the cliff is 25 metres high, you should not go closer than 25 metres to it. Don’t be tempted to explore recent cliff falls. And pay attention to any signs telling you not to climb cliffs – they are there for a reason. Rocky coastlines are great fun to explore, especially if there are rock-pools where you can study marine life. 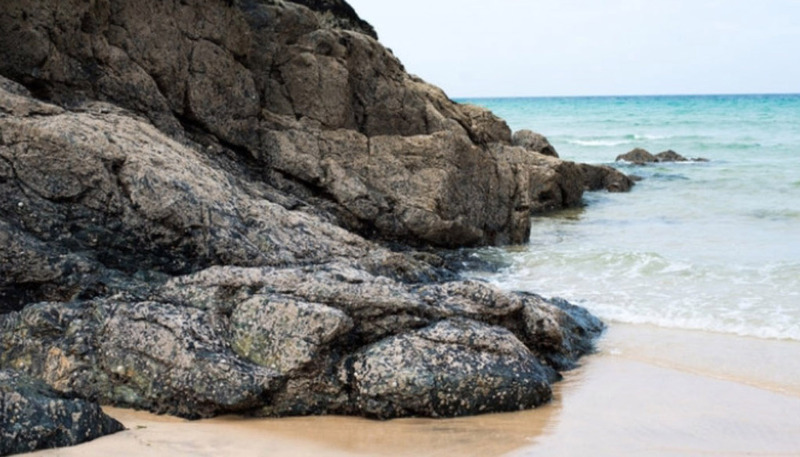 But remember that rocks are very unforgiving if you slip and fall or you are caught by an incoming tide.Wet rocks are very slippery and if you fall, you could be badly hurt and unable to get back to shore. Rocky coastlines are often lonely and there may not be anyone around to hear you shout for help if you get stuck. Don’t be tempted to investigate cliff caves. The cliff face may be unstable and dangerous, or the tide may come in and cut you off. Always know what the tide is doing and if it is coming in, watch it closely and give yourself plenty of time to get back to shore. Rocks are extremely treacherous in fast-moving water. Don't get cut off by the tide. Winter walks along our coastlines can be beautiful but please check on weather and tides before setting out. These walkers found themselves cut off by the tide on a narrow cliff ledge. Fortunately they were unharmed and brought to safety by the coastguard rescue helicopter. At the top of a cliff, the views can be spectacular but also dangerous. Don’t become a victim of ‘selfie culture’ – many people get themselves into trouble when trying to take a dramatic photo of themselves on a dangerous cliff edge. The cliffs along the UK coastline are continually eroding. It’s impossible to predict when the next bit might go – and it could be a few small rocks or several thousand tonnes. be responsible and don’t take unnecessary risks or let other people in your group do so. Getting stuck in mud and quicksand is a favourite plotline in films and books, but it can really happen, especially in wide, flat estuaries and bays. 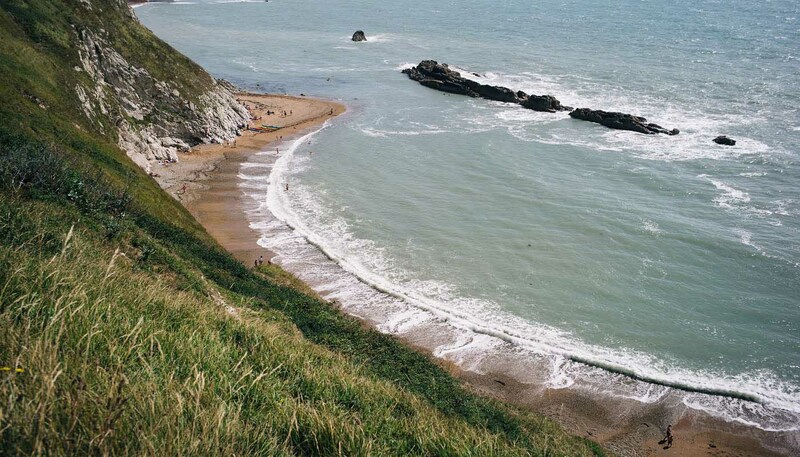 Never try to cross a bay – the ground can look firm and safe, but be incredibly treacherous. if you have a mobile phone, call 999 and ask for the Coastguard. If you don’t, shout for help. This was not an exercise. 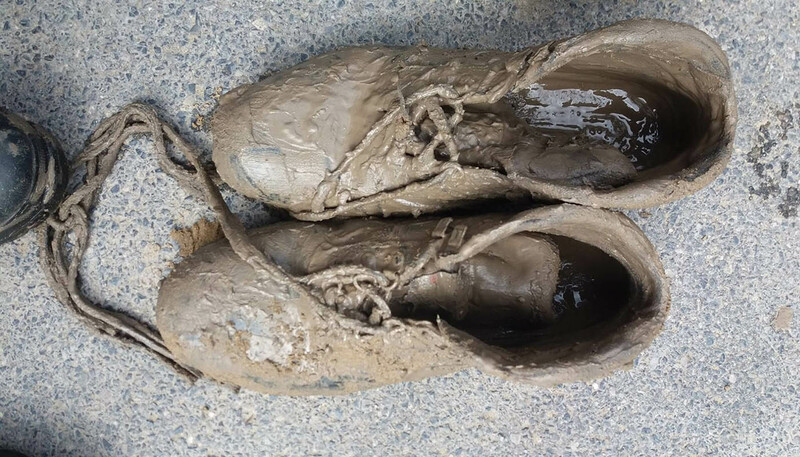 These people found themselves stranded in the mud. They did the right thing and called 999 for the coastguard. Joe and Petunia 50 years on. 50 years on and here is our tribute to the Joe and Petunia public information film. The message remains the same, if you find yourself or anyone else in trouble at the coast call 999 and ask for the coastguard. Whatever your sport, make sure you get trained first. For almost all watersports, you also need to be a competent swimmer. Make sure someone at home knows what you’re doing, especially your points of arrival and departure, planned timings and who else is in your group. Keep an eye on the weather and tides and don’t brave the sea in conditions which are beyond your capabilities. If in doubt, don’t go out. Wear a buoyancy aid and check that all your equipment is functioning properly. If you’re driving an open powerboat, make sure it’s fitted with a kill cord and kill switch and that you use them correctly. If you go scuba diving, familiarise yourself with new or different gear before planning deep dives and always dive within your limits. Never dive alone. 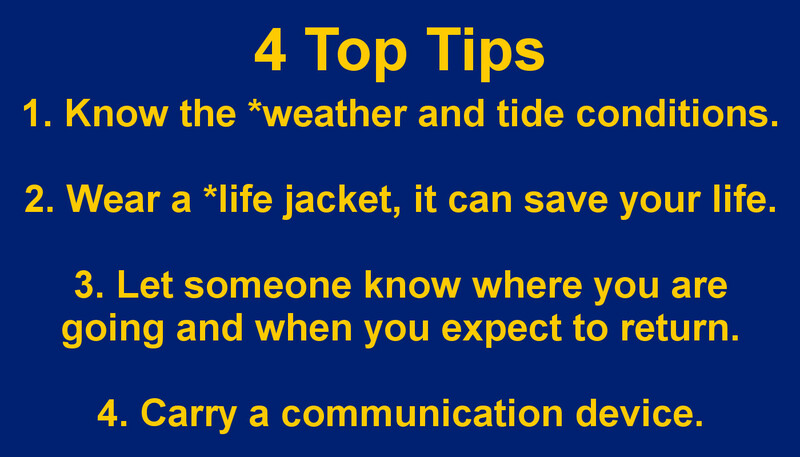 You can also find advice on the RNLI, RYA and the Met Office Websites. a charged mobile phone in a plastic bag. If you get into trouble, you can call 999 for the Coastguard even if you have no credit left. But remember that mobile coverage is not always reliable at the coast. a VHF marine band radio (fitted with DSC if possible) and learn how to use it. You can call the Coastguard on channel 16 on your radio. For advice on which devices suit your activity speak to the Coastguard or your sports national governing body.